27+ ACRE LAKE MELROSE 3/3 HOME Perfect for anyone searching for country living outdoor space with amenities close by. This lakefront property is a mile from the heart of Historic Melrose and all it's charm, and only minutes away from Gainesville, Ocala, Jacksonville, and Palatka. 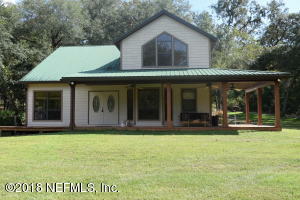 Bring your horses/pets or easily turn this space into a hunters/sportsman dream lodge, enjoying the surrounding wildlife. Adjoining 15+ acres of Lakefront land is also available. Shown by appointment only.